Sundays 9:00-10:00AM. Upbeat, kid-friendly, informative & inspiring. A unique blend of contemporary and traditional music. Sunday School for children ages 5 and above. Food for the mind, body, and soul! St. Mary's serves the working poor and provides food for the hungry 5 days a week. On-site assistance with housing, medical, legal, and mental health concerns is also provided by the Institute for Human Services on the last Thursday of every month. 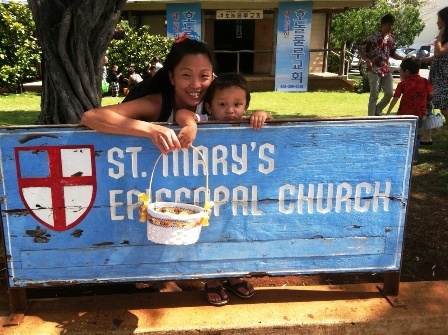 St. Mary's supports missionaries who serve in Cambodia, Indonesia, the Philippines, Thailand, and Uganda. Just after the turn of the century, the area called Moiliili, which then was only a sleepy settlement on the outskirts of Honolulu, was chosen as a site for mission work by the Missionary District of Honolulu. Key to the work in these earliest days was a mission house constructed in 1912 on the present site of St. Mary's parish grounds. Night classes for adults, a day school instructing girls in sewing and house-keeping skills, education in the Faith, a free neighborhood medical dispensary and other ministries were some of the first uses of the new facility. The mission grew steadily, and in 1917 it was able to build a church building, followed in 1918 with the opening of the doors of St. Mary's Home, an institution for the care of homeless children. It housed 219 children before its closing in 1949. Throughout much of the early period there was no resident clergyman, and services were conducted by priests from the cathedral or neighboring congregations. ​In 1958, the congregation razed the mission house, moved the church to a new foundation on the former mission house site and built a substantial new parish house on the site previously occupied by the church. The move was a manifestation of what had gradually become clear in the previous nine years - that St. Mary's had evolved as a church with attendant ministries rather than a ministry with an attendant church. In the late '50s a preschool was also built on St. Mary's property. In the late '60s and early '70s two things of great importance took place: 1) the congregation became a parish; and 2) a number of people at St. Mary's became involved in the charismatic renewal. Achieving parish status was important to the congregation's understanding of its growth in purpose. No longer was it a "project" of the diocese; it accepted responsibility for its own life and mission. The charismatic renewal became the center around which the parish developed a unique character. ​In the mid '80s, another era of life was initiated with the construction of a new church building to accommodate the growing congregation. The former parish hall was converted into the main church and the lovely old church building was preserved and used for the early Sunday service, special occasion services, small weddings and funerals. In the early '90s, St. Mary's became very concerned over certain positions gaining acceptance in the Episcopal Church at the national level. Many members at St. Mary's considered these new positions to be contrary to biblical revelation, traditional church doctrine, family values and godly moral principles. 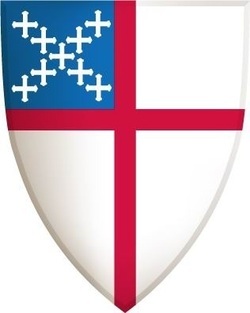 After much prayer, contemplation, and discussion, the former rector and approximately half the congregation felt morally obliged to dissociate themselves from the Episcopal Church (USA). Others, though sharing similar concerns, chose to remain and work within the denomination for reform. This swift but graceful transition opened the doors of service, commitment, and ministry for St. Mary's remaining members. In 2001 the parish called The Rev. Dale C. Hathaway as rector, and in 2002 we celebrated our 100th anniversary. These events signaled a renewal and re-energizing that is now beginning to unfold in our common life together. The Rev. Prof. Gregory Johnson was installed as rector of St. Mary's on January 5, 2014.